I’m looking forward to the final event in the Figuring Sea Level Rise, next Friday at UCSB. Here’s an artist who knows some great Photoshop tricks to visualize cities impacted by rising sea levels. 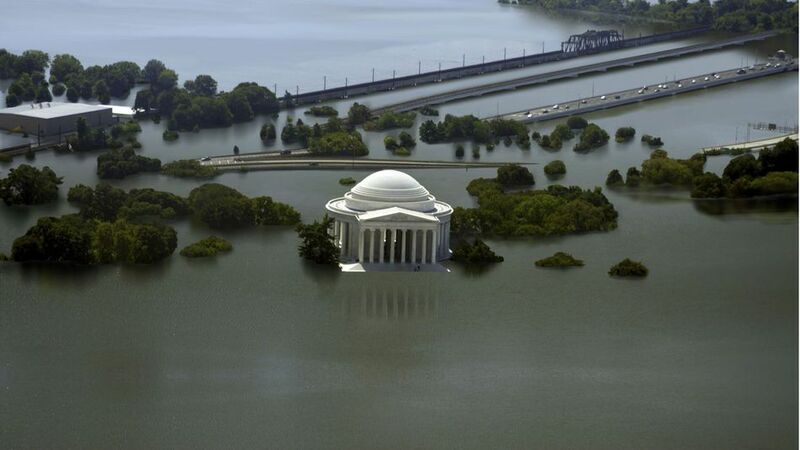 “Climate change and global warming may cause sea levels to rise and flood coastal cities across the world. Over the past century, the Global Mean Sea Level has risen by 4 to 8 inches. And according to estimates by the National Oceanic and Atmospheric Administration (PDF), it will keep rising between 8 inches and 6.6 feet by 2100. How will the world look if that happens? In November of 2012, The New York Times published interactive maps displaying the effects of the sea level rising, in a series titled “What Could Disappear?” The maps show how much land the sea will claim in the future, if it rises by 5, 12, and 25 feet. Nickolay Lamm, a 24-year-old researcher and artist saw the interactive maps and wondered: “What would this actually look like in real life?” Lamm told Mashable in an email interview that “the only imagery I had of sea level rise came from Hollywood.” So he decided to put his skills to work. “I felt that if I could bring these maps to life, it would force people to look at sea level rise in a new way,” he said.